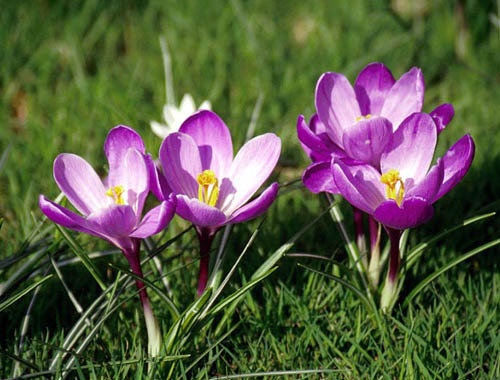 Early-spring favorites, hybrid crocuses carpet the ground with blooms in shades of white, purple, yellow and orange. Blooms may be a single color, bicolors, or marked with striping and mottling. Individual plants are upright and grass-like, but spread to form large clumps. non-aggressive - Plants spread to form large clumps, but are not usually a nuisance. fragrant - Blooms are sweetly fragrant. Propagate by division or separation - Divide in early fall. Plant the corms 2" below the surface of the ground. 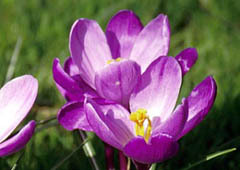 When forcing these bulbs, do not move them into a warm location until the flower buds show some color. Moving them earlier may result in failure to flower. 'Blue Pearl': pale purple/blue blooms with yellow throats. 'Cream Beauty': very hardy plants with yellow throated creamy white blooms. 'Dutch Yellow': large, vivid yellow blooms with darker yellow striping near their bases. 'E.A. Bowles': dark golden yellow blooms with darker golden striping at their bases. 'Ladykiller': white blooms with purple outsides. 'Snow Bunting': pure white blooms. 'Zwanenburg': pale blue/purple blooms with darker purple spotting inside and flushed with gold. 'Zwanenburg Bronze': yellow blooms flushed with bronze on their outsides.